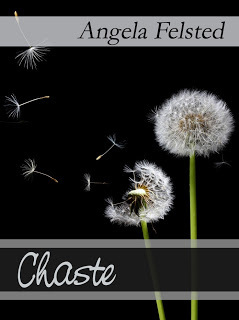 Angela Felsted has a new book - CHASTE – that came out this month and she doing something a little bit different to celebrate its release. When everyone is busy mailing Christmas cards and spending time with friends and family, she decided to add to the joy of the season by having those interested participate in “Quinn’s Cookie Exchange,” named after the main character of CHASTE, a teenage boy who knows how to cook. So today I’m posting (with my wife’s help) one of my favorite cookie recipes. I give you -- Easy Lemon Cookies. 2. Pour cake mix into a large bowl. Stir in eggs, oil, and lemon extract until well blended. Drop teaspoonfuls of dough into a bowl of confectioners sugar. Roll them around until they're lightly covered. Once sugared, put them on an ungreased cookie sheet. 3. Bake for 6 to 9 minutes in preheated oven. The bottoms will be light brown, and the insides chewy. This is an edited/updated blog post from 2010 which is still very relevant. As per our family’s tradition, our Christmas tree’s started going up the day after Thanksgiving. Yes, I used the plural because we put up as many as ten tree’s (eleven if you count the one I erect at work). 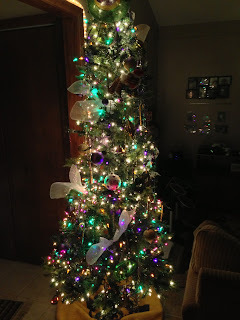 Of course there’s one main tree in the living room, but various sized specialty tree’s also spread throughout the house. There’s the cute and cuddly teddy bear tree in the sun room, the eclectic world travel tree in my wife’s office, the reverential LSU tree in the playroom, and other creative interpretations scattered here and there. I think I mentioned before that we get into Christmas around here. Early this morning as I was making my zombie march from the bed to the coffee pot, I paused and admired our behemoth twelve-foot centerpiece tree. 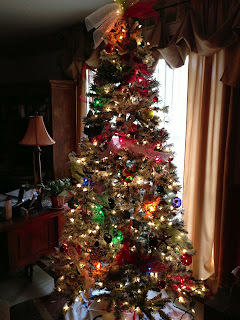 Even in the dark, unlit, it was a vision of holiday warmth that filled my heart with pride & joy. Truly an impressive sight. In the back of my mind I heard it whispering to me (it was 6:30 in the AM after all), begging me to flip the switch and let it become what it was created to be. So before I went any further I sent currents of electricity through the miles of intertwined wire and awakened the hundreds of slumbering crystals. The tree came to life with an explosion of twinkling lights and reflective shimmers of all shapes and sizes, lifting the corners of my mouth along with my spirits. When the coffee was brewed and the morning paper retrieved, I settled down at my desk to check emails and catch up with goings-on in the blogosphere. Whenever I wasn't reading a page or staring at the monitor, I'd find myself turned around staring at the tree, taking in its awesomeness. At one point when I swiveled back to my desk I happened to catch sight of a few pages from my most recent manuscript. That's when my affinity for analogies led me right where I needed to go. For the past month I’ve been dragging my feet as far as my most recent project is concerned, trying to muster the energy for the next round of revisions. As I stared at it there collecting dust, I realized that my manuscript was not unlike an unlit Christmas tree. Impressive in its own right, but begging me to flip that switch and send it out to realize its true potential, what it was created for. An ornament here, some tinsel there, and it would be ready to dazzle. 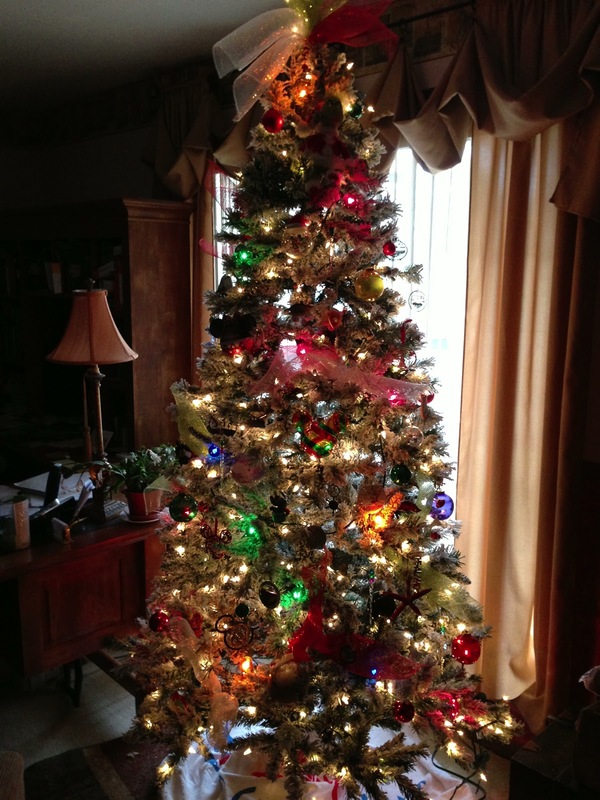 And like a Christmas tree, no two were alike…but all of us are drawn to certain types. Even Charlie Brown’s tree had its admirers (I'm one). To take the metaphor even further, putting up a Christmas Tree (especially an artificial one) is not unlike writing a novel. First there's the frame, then adding on the branches and filling out the foliage needles, and finally layering in all of the various adornments in your own special way that makes the tree truly yours. But the part that I'm really talking about is when you give your tree that all important squint test. You know what I'm talking about, when you step back and narrow your eyes, allowing them to go out of focus, so you can see where the dead spots on the tree are. This is a crucial step in tree decorating/writing, where a lot of people turn to others for help. We are just too close to the material to be able to see those glaring holes. But I believe that as we grow as writers and practice our craft, we will become better skilled at spotting them ourselves. So what about your unlit Christmas tree, how close are you to flipping that switch? Have you performed a squint test yet? 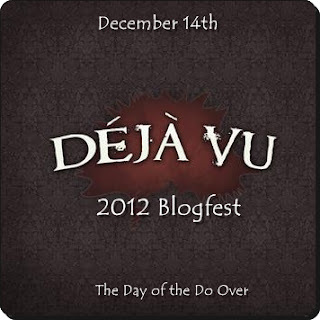 Welcome to the Déjà vu Blogfest…the day to re-post one of your previous blogs from this year. Which one? How about your personal favorite…or one you feel didn’t get the recognition it deserved…or one that garnered the most comments. The choice is totally up to you. If you want to take part, or see a list of everyone participating today, you can click on the badge below. A couple weeks ago the company I work for sent me on a week-long leadership development program located in an isolated spot in Northwest Arkansas. I was told before I went that it would be an experience to help clarify personal and professional values, improve self-awareness, and identify emotional blind spots. To say that I was apprehensive going into the week would be a colossal understatement. I envisioned a lot of sitting round camp fires, holding hands singing Kumbaya, and group sessions where we candidly shared our inner-most feelings. The introvert in me was shitting mental bricks! But continuing with my 2012 theme of making it uncomfortable in my comfort zone, and recognizing this could be an excellent warm-up for my agent pitch a week later, I opened myself up for the adventure. I’m happy to report that I thoroughly enjoyed the week and even learned a couple things about myself! One of the exercises we were encouraged to do was take a hard look in the mirror, ignore the crooked smile, half-raised eyebrow, and all other physicality that means very little, and go to a place inside we rarely visit. Once there we were to take inventory of what we believed all our core values might be. We wrote them down and then slowly peeled away the layers by highlighting those values that really meant something to us, our true core. I started out by listing between 20-30, then meticulously narrowed the list to seven that I really felt passionate about. An important part of this whole process was remembering that true core values remain intact regardless of what else is going on around you, or to you. Imagine the mirror you’ve been staring into, now flip it upside down, what happens to your reflection? It remains unchanged. Whatever is going on in the world around you that changes the orientation of that mirror, your image…your values, should remain constant. A lot is made sometimes about situational ethics, where the guidelines are flexible and the end can justify the means. But can our principles, our morals, afford the same latitude? Through our writing we often have the luxury of experiencing a different set of values with the characters we create, and we work hard to maintain believability by ensuring their actions stay true when their mirror flips. How ironic is it that we work so hard to get those details just right in our stories, but we waffle in our own lives? I know I’m making this all sound super simple, when it’s really not. Values are easy to maintain in a vacuum, but life is rarely like that. We will be tested, and sometimes we’ll come up short. I know I certainly have. But the trap is allowing yourself to blame it on circumstances. 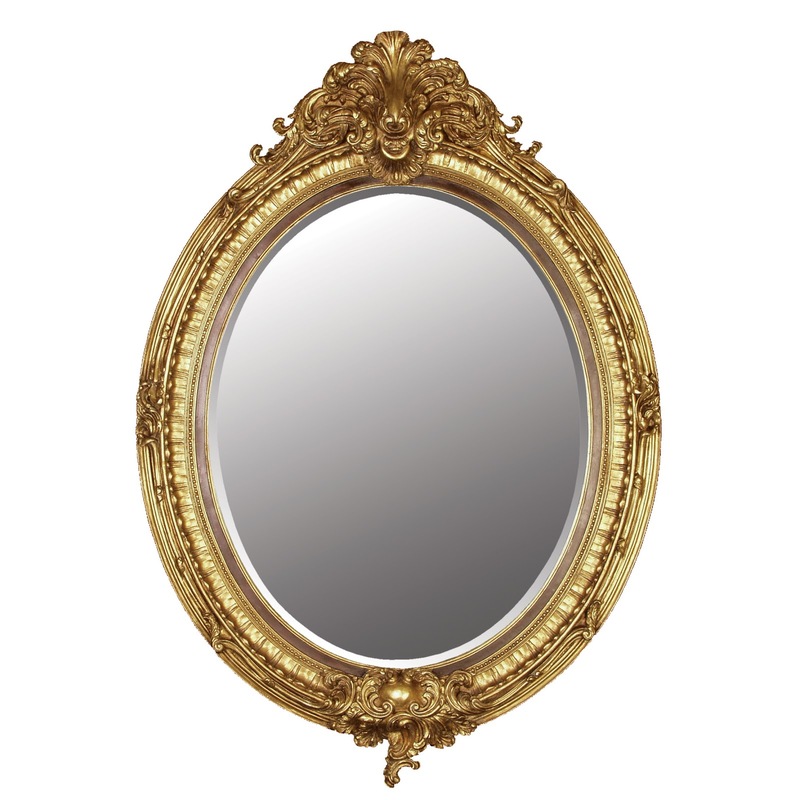 Whether lying flat, on its side, or upside down, the reflection in your mirror is the same you. Embrace that person! Raven's Claw has a more developed plot, the story flow is good, and its playful nature puts a chuckle with a smile at the end - ME Johnson. It wasn't clear why the protagonist had to pay the price he did. It was a clever and self-contained piece, but I didn't understand what the protagonist had done to deserve to die. - Ann Collette. Even though there were magical elements, I felt like I could understand the world right away. I'm also very curious as to why anyone would want to kill a mere janitor... I'm not as enthralled with the ending of the piece as I am with Raven Claw's. It's hard to answer the questions that are left if you kill of the character we've been following. - Tiana Smith. I’d tell the writer to watch out for overusing dialect in the dialogue. The narrator’s voice is easy to follow and distinct in its own right. However, when Mr. Jaspers spoke, it was quite jarring in a way that didn’t feel authentic, so much as it took me out of the story. - Sarah LaPolla. It was difficult to judge. It would have helped to know whether this was a prologue or whether this is the voice that would be used throughout the novel. It’s less problematic to have the omniscient voice if it’s a prologue (which I assume this is rather than limited third person because the reader is told about the truck’s thoughts yet Mr. Jaspers seems unaware of them). I didn’t really understand whether this was a world in which trucks are sentient, whether it was only this particular truck or why we were being told what the truck thinks unless the answer to these questions is important. I also wasn’t sure whether the accent would continue throughout the book, because this can be tiring for readers to follow. However, of the two pieces (both of which, again, were well done), Snivvy Crank is the one that had me most intrigued to continue reading. - Lucienne Diver. I want to congratulate both writers, but especially Snivvy Crank for a hard fought victory. So...just who are these talented writers? Well Raven Claw is none other than Chris Fries! And our champion, Snivvy Crank, is the talented Mark Hough! Mark will now join Tiana Smith (2011 Champion) in the very exclusive club of WRiTE CLUB champs, as well as becoming a judge for next years finals. If you’ve spent any time reading on-line forums, you’re probably familiar with the term Bump. It’s a word used to describe the action of moving a topic back to the top of the page so that more readers will see it when they enter the forum. You do this by simply adding a comment to the topic (usually just the word bump) and the entire thread slides back to the top. Why is this necessary? Because as new topics are added and the interest in your subject erodes, it slides further and further back on the list of subjects until it falls off the first page and into obscurity. Bumping can sometimes rejuvenate awareness and generate more discussion. Today I’m doing a bump…or at least the blog version of one. A couple of weeks ago I announced the Déjà vu Blogfest for 2012 and judging by the anemic response so far, I need to make sure the news is not lost. If you read my previous announcement and signed up already, you can toddle along to your next blog, nothing new here. But if you missed that post…please keep on reading. Want to know one of my pet peeves about the way our blogosphere operates? You can miss some really awesome posts if you have to be away for a while and unable to keep up with your favorite blogs. While WRiTE CLUB was going on I’m certain I missed hundreds of quality posts. During the A to Z Challenge in April I missed some truly outstanding posts. It’s really hard to catch up when things get like that, so what I do to get back in the swing of things is simply pick up with everybody’s latest post. You know what that means? A post about the signing of an agent…missed….a book contract finalized…missed…a cry for help...missed...a birth announcement…missed. Other special event in a bloggers life…gone. I just shake my head when I think of all of the special posts I’ve missed this year. And then there are the informative posts about topics I’m dying to know more about… yep, I probably missed some of those as well. It’s for this reason that last year I hosted the Déjà vuBlogfest, and before that it was the BLOG RECYCLE STATION. Well, I’ve decided to turn last year’s blogfest (which involved participants re-posting their favorite blog offering of all-time) into an annual event. So this year I’m hosting…. On December 14th (next Friday) anyone taking part will re-post their favorite blog offering from 2012, or one that never received the exposure it should have. If you’re interested please sign-up to participate (click on the badge to take you to Mr. Linky), then shout out to all of your blogging friends and encourage them to sign up as well. Take the badge above and plaster it everywhere, blogging graffiti gone wild. Then on December 14th as the day unfolds and everyone hops from one blog to another, what they will be reading is the best of the best (as determined by you) from this year. The blogosphere will be chock full 2012 writing brilliance! Encouragement, enlightenment, knowledge, bared souls, stimulation, hilarity, insecurities, success stories! All on display…the very same day. And it couldn't be any easier to take part...no writing necessary! 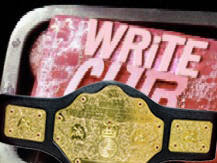 Monday I’ll reveal this year’s WRiTE CLUB champion, along with both of the finalist identities, but today I want to discuss a few take-a-ways from this year’s contest and a couple ideas for improving it. I am also open to suggestions from you, so let me know what you liked, didn’t like, general observations, and/or any other ideas that can help me elevate this project to the next level. Any of you who followed along during the 19 week process should already know what a huge undertaking it turned out to be. Too HUGE! I was unprepared for the 100+ submissions that poured into my wife’s email box (there were only 30+ in 2011). To compensate for the flood of interest, I increased my posting to three times a week and extended the contest by several weeks to fit in as many as I could, and still I couldn’t get to everybody. 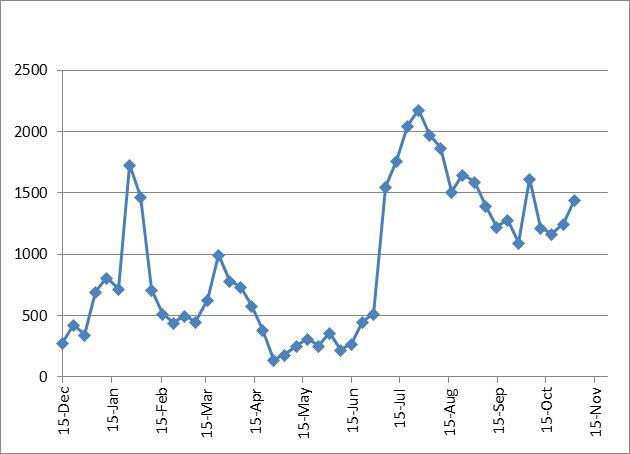 It ended up running 19 weeks, 63 posts, and provided 69 writers an opportunity to learn something about their writing. This had several ramifications, none of which were favorable for me…and ultimately WRiTE CLUB. First off, I could no longer post anything but WRiTE CLUB stuff (with very few exceptions), which was incredibly constipating…creatively. Second, with my time totally consumed by the contest I could no longer follow my beloved blogs, and since I wasn’t visiting them…they stopped visiting me. This ultimately hurt WRiTE CLUB. And finally, because the contest ran on for so long, and because I wasn’t commenting on other writer’s blogs, people lost interest. 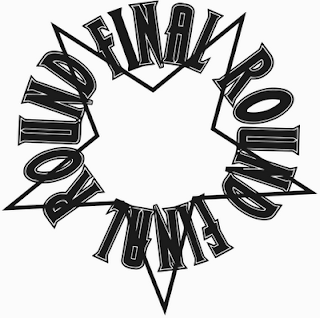 The first bout of the first round garnered 91 votes…but the semi-final bouts in the playoffs only boasted 24 and 29 votes respectively. My post during the rest of the year usually average 30-40 comments per, so I was actually doing worse towards the end of the contest. That doesn’t mean people weren’t paying attention, or that the contest was a bust. 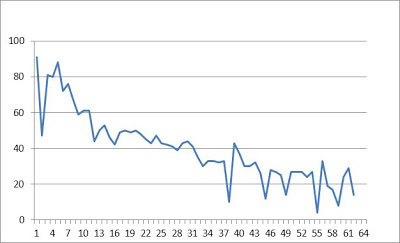 The chart below shows the number of votes per post during the 19 week period, and even though you can see a definite decline, the second chart depicts the number of page views per week for my blog in 2012, and you can see how much WRiTE CLUB elevated those numbers. So what should I do to prevent the problems I encountered from happening next year, assuming I still see the level of submissions? First, I need to find a way to shorten the preliminary rounds down to eight weeks instead of twelve, with a maximum of two posts per week. This will probably necessitate the use of some sort of process that whittles down all of the entries into a pool of thirty-two, and the need to disallow any new entries once the bouts begin. This should allow me time to continue my normal blog reading/posting schedule and help keep others interested. There should also be some kind of incentive for voting, maybe a prize drawing at the end of the contest -- the more bouts you vote on -- the greater your chance of winning? My wife would also like to see me standardize the way people submit their entries to make her life less hectic, as well as having voters use their linky list number when they vote to make authentication easier. I feel that WRiTE CLUB is a great concept and I definitely want to keep it going, but without the added stress and voting drop-off. After all, the real benefit for the contestants is the feedback…via vote or critique…that our readers provide. If I can’t generate enough interest throughout the entire run, then I am not delivering on my promise. So what about you? Have any ideas? I sure would like to hear them, so leave one in the comments below. I'd really appreciate the input. Here we are. Two writers...but only one crown. Who will make a favorable impression on the judges and be left standing? Let me start off by congratulating not only Ravenclaw and Snivvy Crank for surviving nineteen weeks of grueling competition and landing here in the final round, but every single writer who was brave enough to submit an entry to my contest. This is the part of WRiTE CLUB where...if you so desire...the masks come off. I encourage everybody (except our finalist) to use the comments below to let us see who the person behind the pen name is. I know there are a lot of fans who really want to find out more about you and your writing story. It would also be helpful to us know what number you were on the linky list, so we can follow the link back to your own blog. I've already emailed Ravenclaw's and Snivvy Crank's new 500 word writing sample to our panel of judges (if you forgot who they were, check out the list HERE) and I'll post the results, along with any critiques they provide, next Monday (Dec. 10th). But that doesn't mean you don't get a say. I've also posted our two finalists pieces below so you can have one final chance to vote. If by some remarkable chance our judges come up with a split decision, your votes in the comments below will decide the tie-breaker. 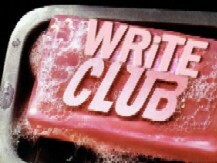 I will be back on Wednesday to post some takeaways from this season's WRiTE CLUB, and I'll also be asking for recommendations for what you'd like to see be different for next year. Make sure you stop by for that. In this corner, welcome to the ring our first finalist.....Ravenclaw. Here are links to his original entry, the edited version, his 2nd submission, and the edited 2nd. The cilia on Overseer Moros's forelegs undulated in a display of arrogant irritation, and all six of his bulbous eyes rotated to focus their full attention on me. The piercing shaft of his whip-tail hardened; thick drops of neural poison forming at its tip. The deadly ooze glistened in the faint light of the Overseer's chamber. His vocal aperture vibrated. "Please continue your report, Agent Dolos." His tone was gentle, but the underlying menace was palpable. Trying to hide my terror, I chose my words carefully -- the previous agent had not lived long after admitting his failure. "I have successfully infiltrated one of the planet's centers of power, Overseer. Our conquest is merely a matter of time." "Yes, you have already expressed this opinion. But what facts do you present to corroborate it? I need more than empty promises." The Overseer's whip-tail began to sway. The air of the chamber filled with the sharp, vile odor of his anger. "Success is assured," I said, "although there are challenges. Our pre-landing information was..."
"In what way? Does the form you inhabit allow you to walk among the natives?" "Yes, Overseer. The basic design is flawless. I am projected into the bio-shell with full control and I pass easily for an inhabitant of this planet." "Is the shell in any danger while it is empty?" "No. The inactivity of the bio-shell is taken as normal sleep by all who see it." The whip-tail swayed wider, its dripping poison splattering onto the Overseer's command platform. "Then I hear no reason for failure. You will succeed or suffer the consequences." I fought the panic erupting in me. "But, you see, Overseer, the form we chose--"
Moros raised his voice, his vocal aperture throbbing in violent waves of sound. "The form seems sufficient to accomplish our goals, Agent Dolos. If there is failure, it will be because you are to blame." The whip-tail swung past me, much too closely. I stammered a reply. "Yes, Overseer." Four of his eyes turned away, signaling my dismissal. I turned and fled, pushing my way through the membranes that surrounded the command chamber. My instincts screamed at me to keep going, to leave the ship immediately, but I knew it would only lead to a painful death in this world's oxygen-rich atmosphere. I had no choice but to return to the projection chamber. There, I strapped myself into the projector and pressed my gripping digits onto the control pad. It glowed in response. The machinery whirred to life and I felt the disorienting tug as the process began. Then I was swallowed in a burst of blinding light as my awareness shifted to the bio-shell. I found myself curled up on top of the seated form of one of the planet's leaders, his giant hand almost covering my body. Another native standing nearby spoke. "Mr. President, I just don't understand why you allow that damn cat to sleep on your lap." And in the far corner our other finalist, let me re-introduce.... Snivvy Crank. Here are links to his original entry, the edited version, his 2nd entry, and the edited 2nd entry. Mr. Jaspers tossed the school board’s “parting” gift unopened onto the truck’s vinyl seat. The truck--a rather smart fellow for a pick-up--groaned a warning about the package...a warning that unfortunately went unnoticed by Mr. Jaspers. The Scotsman was busy feeling old and defeated, staring up at the school with a sadness only another ex-janitor could appreciate. Jaspers sighed again and turned his attention to the brown paper parcel, which sat tauntingly on the seat. The truck groaned again but Jaspers’ vein-streaked hands were already fumbling with the twine and delving through the mass of tissue paper. “This” happened to be a pocket watch. The Scotsman frowned. That was the problem: he couldn’t give the sensation a name, but it felt akin to peering over the edge of a crag…when time seems to stop…. He examined the image on the lid more closely. It certainly was a strange picture to have engraved: the hooded figure of Death holding an hourglass. Mr. Jaspers’ frown deepened as a scorching cloud of ashen smoke began to billow out of the face. “Well noo, that cannae be good…” he thought; and then Mr. Jaspers blinked. Slowing time was a particular talent of Mr. Jaspers’. It was much easier than it seemed; like stretching a piece of silly putty. He did this, pulling and tugging with his mind until the seconds grew thin and wispy and seemed to stretch on and on. Then, at the very edge of infinity, Jaspers dropped the watch...and ran. He could see the watch in his mind, floating where he’d left it, as he limped faster and faster, feeling time sway and bounce under his bad leg. From somewhere behind him there was a piercing blast of white light.